Let me preface this by saying these are just my personal opinions about the 2017 hair trends — nothing official here. This is just what I've seen from surfing Pinterest and Instagram! However, I do surf a LOT, so I feel pretty comfortable making predictions about what's hot and what's not. I'd love to hear your favorite predictions, too! These are the hair trends I'm ready to see this year! Let me know in the comments which ones you agree with. I'm determined to MAKE this a trend, if the fashion and beauty world isn't headed in that direction already. The long, ratty extensions I see all over Instagram need to go. Fellow bloggers, if you're promoting extensions that don't blend in with your real hair, are fried on the ends, or just don't look like healthy REAL hair — please toss them now!! It doesn't matter how much you paid for them; they need to go!! Stop trying to make people think that look is OMG GOALS, because it's not. I would 1000x rather see healthy shiny hair that is all natural, bouncy, and maybe a little bit shorter vs. super long extensions that are dry and lifeless. Aren't these styles much prettier to look at than long, fried, and lifeless hair? The best way to keep your hair healthy so it will grow long and strong is to eat properly, have hair trimmed regularly, and make sure you're deep conditioning the ends with something like Organic Coconut Oil at least once each week. Speaking of healthy, I'm declaring the blunt cut back! Chop those dead ends straight across at the bottom so the ends are thick and bouncy. I love the look of a blunt cut with loose, beachy waves, so that gets my vote as the big hair cut trend for this year. My next haircut will definitely be a blunt cut with Alicia Silverstone (a.k.a. Cher from Clueless) as my ultimate inspo. Btw, are you on Pinterest? Follow our hair board to see all the latest hair trends we're pinning over there. [Photo sources] Click on any photo to see it larger. Lana Del Rey has mastered the retro look, if you can't tell by all the shots I posted of her! This style works well with shoulder length or longer hair, and it helps if you have a few face framing layers at the front (think really long, grown out bangs). The main characteristics of this look are the deep side part and very smooth and glossy curls. Use a product like Macadamia Natural Oil (which smells incredible) or Kerastase to get the gloss. I had to throw a fun one into the mix, and what's more fun than bubble braids? It's hard to find many inspiration pictures, because not many people have been posting this one yet. Maybe I'll start a trend?! 🙂 Let me know if you want a tutorial for this one on my YouTube channel, because I'm going to try to shoot a video this weekend if I can catch a break between studying. You need to have fairly long hair if you want the bubbles to mimic braids. If you want to create a mohawk style along the top of your head, you can do that with shorter hair. Obviously this isn't something you can wear to work (unless you're in a really creative industry), but it's a fun weekend look. I got soooooo many compliments when I wore my hair this way! Festival fans will love this option! I think scarves are a fun way to draw attention to your face — and keep cooler during the summer months. They also add some interest to an otherwise basic outfit, like when you're wearing a solid color tank or white tee. Free People and Shopbop are my favorite places to shop for hair scarves (also called hair wraps, head wraps, and sometimes headbands). Urban Outfitters usually has really cute options, too, now that I think about it! Messy buns will always be in style. They're the ultimate lazy day hairstyle, and it's easy to make them look as pretty or as unkempt as you like! 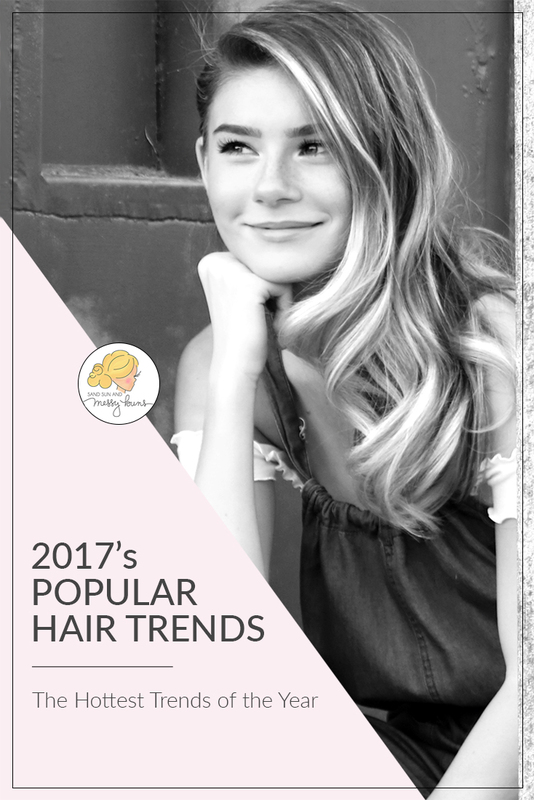 What are your picks for the hottest 2017 hair trends? Do you even like trends or do you prefer to stick with the classics? Let me know your predictions in the comments and I may add them to the post! PS: If you want to try a fun makeup trend, you might want to learn how to make fake freckles look real. WHOA! That unicorn bubble braid is stellar! Loved all of these looks, especially the wavy blunt cut! I have a blonde bayalage lob that I’m so obsessed with. With beach braids, it is the PERFECT style.